TUSCALOOSA, AL—The University of Alabama’s Bryant-Denny Stadium opened in Tuscaloosa in 1929, and is currently undergoing a massive renovation that, by the beginning of the 2010 season, will expand seating by almost 10,000 to a total of 101,000. The home to college football’s Southeast Conference powerhouse Crimson Tide is so old, in fact, that no facility drawings of the concrete slab that rings the top of the stadium were available. So to attach 36-foot poles that could each hold a line array of four QSC speakers, Baker Audio of Atlanta, GA needed to conduct hydraulic pull tests on the concrete, applying 10,000 pounds of pressure to ensure structural soundness. QSC WideLine-8 line arrays, each consisting of four WL3082-wx cabinets, are installed on 14 speaker poles attached to the concrete slab on Bryant-Denny Stadium’s north and south ends. Twenty-four QSC WideLine-10 arrays, each with three WL2102-wx cabinets, ring the stadium’s lower bowl. Prior to the $80.6 million expansion to the south end zone seating, in 2008 the University of Alabama contracted consultants BAi, LLC of Austin, TX, to design a completely new audiovisual system for the stadium, including a distributed- audio PA system for the stadium bowl and an expanded broadcast cabling infrastructure. Baker Audio completed the first installation phase just before the Tide’s BCS National Championship season started in September 2009, serving as the general contractor on that part of the design implementation. This summer, as the new south end zone seating is being constructed, the systems integration firm is again hanging loudspeakers and mounting line arrays to poles. The PA system’s primary purpose is to relay spoken announcements, and as such, voice intelligibility was a key factor in BAi’s loudspeaker choices and in its overall system design. For the five years prior to the installation of the new system, Bryant-Denny had a point-source audio system. “The owner was unhappy with the performance of the existing system due to the lack of voice intelligibility provided to the seated audience, and gain-beforefeedback issues on the playing field,” said John Miller, principal of BAi. QSC WideLine-8 line arrays, each consisting of four WL3082-wx cabinets, are installed on the 14 speaker poles attached to the concrete slab on the stadium’s north and south ends. Twenty-four QSC WideLine-10 arrays, each with three WL2102-wx cabinets, ring the stadium’s lower bowl. These lower arrays also each incorporate a JBL AM6212 speaker for downfill. Forty of the 90x50 version of the AM6212 cabinet provide coverage for the east and west upperdeck seating areas. For under-balcony coverage in the lower seating bowl, Bryant-Denny has 86 Community WET-Series W2-2W8 two-way fullrange cabinets. Concourse areas are covered by 120 QSC AD-S52 surfacemount two-way loudspeakers and 360 Tannoy CVS 6 six-inch speakers. Finally, a custom Danley Labs GH40-FG speaker with a TH212-FG subwoofer blasts music toward the field for the players. This replaced a portable system that was not weatherproof. 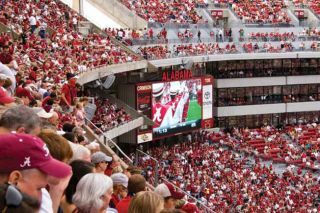 The labor associated with weekly setup and teardown of the portable system and torrential rains during early-season games convinced Alabama the stadium needed a permanent, weatherproof solution, so Baker Audio commissioned Danley to build the new speaker to its specs. A variety of QSC amplifiers power the audio system, including 26 CX1102 amps, 16 of the CX1202V model, 14 CX902s (10 of them owner-furnished), 14 CX502s, six CX602Vs, 14 CX254s, 13 PL4.0s (all owner-furnished), and five PL340s. With help from the manufacturer’s engineers, Baker Audio configured QSC’s new Q-Sys software to control routing and amplifier attributes, developing a GUI for Bryant- Denny’s operators. Jon Whitwell, VP of operations for Baker Audio, served as project manager onsite in Tuscaloosa. He said the goal of the Q-Sys programming was to make it easy for the user to patch and route signals and access game presets from a single interface page, but without allowing the operator to alter the signal processing. Monitoring is the other main function of the DSP software. “Given the numerous zones associated with this facility, it was important to enable the operators to monitor the system for potential short circuiting and temperature anomalies, as well as headroom associated with each individual amplifier,” Miller said. To accommodate all the amplifiers of the new distributed PA system, Baker Audio had to build, in its role as general contractor, brand-new equipment rooms for the venerable stadium, including HVAC systems. “This is something we had never encountered before, but we were able to live up to their expectations and deliver on all the requirements,” said Joe Schuch, VP of Baker Audio. Despite playing the unfamiliar role of general contractor during the first phase of the overhaul, Baker Audio reports that installation went smoothly. The firm was responsible for all personnel hiring and management, and sent almost 30 staff members to Tuscaloosa—specialists in fiber optics, networking, cable TV, sound, and video. “We just had to expand our scope and look outside of the narrow view of sound and video and encompass the entire project in our schedule,” Whitwell said. “We’ve seen it done many times, so our years in the field taught us what we needed to know.” The firm did a full test of the DSP system in its Atlanta office, and shipped all its gear a few blocks from the stadium, to Premier Service, the electricians that Baker Audio hired for the project. The owners were happy with the first phase of the overhaul, according to Miller, Schuch, and Whitwell. After Baker Audio did speaker sweeps with test gear and turned on the new system for the first time, its technicians needed to make only minor adjustments. (Some loudspeaker clusters near luxury suites, for instance, needed to be balanced.) The firm attended the first five home games of the season, though they were required to attend only the first two. (For the final two games Schuch, who served as the senior project engineer for all aspects of the project, was able to monitor and control the system remotely via GoToMyPC.) “We had three or four people each game running sound, looking over the [operator]’s shoulder, personally micing the refs, walking the field—just helping Alabama work the system,” Whitwell said. Trevor Boyer (trevor.boyer@gmail. com) is a freelance writer based in New York.